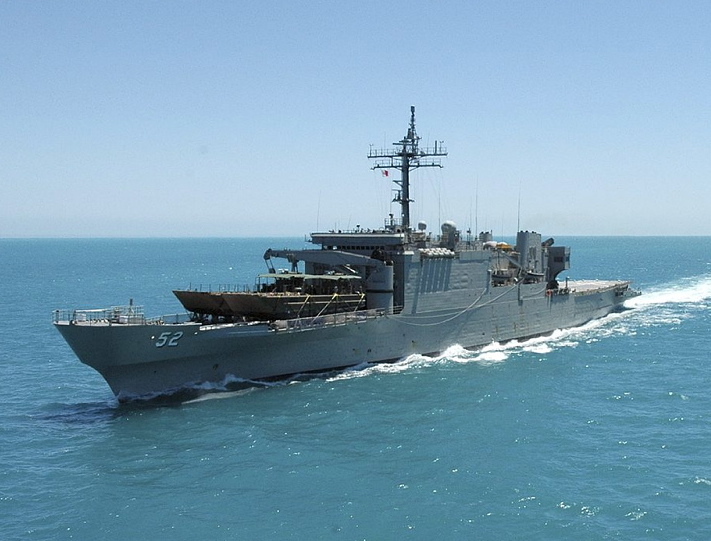 HMAS Manoora (II) was one of two former United States Navy (USN), 1179 class fast tank landing ships (LST) purchased by the Royal Australian Navy in 1994 to bolster its amphibious capability. 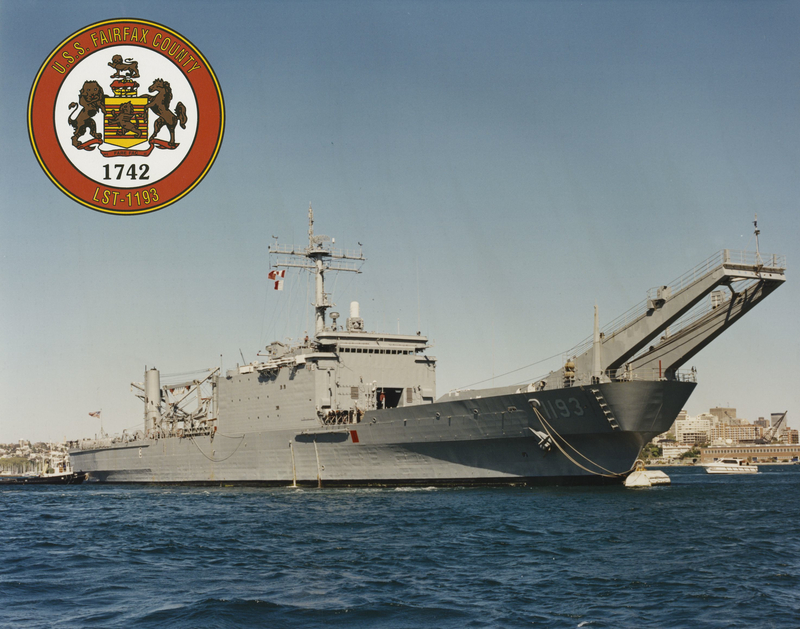 Commissioned as the USS Fairfax County on 16 October 1971 the LST saw extensive service as part of the USN's amphibious force serving around the world in a variety of operations that included service during Operation DESERT SHIELD/DESERT STORM in 1990-91. She transferred to the RAN in September 1994 and later commissioned as HMAS Manoora (II) in a ceremony conducted in Sydney on 25 November 1994. USS Fairfax County secured to a buoy in Sydney Harbour following her voyage from the USA to Australia. She decommissioned at Fleet Base East on 27 September 1994. 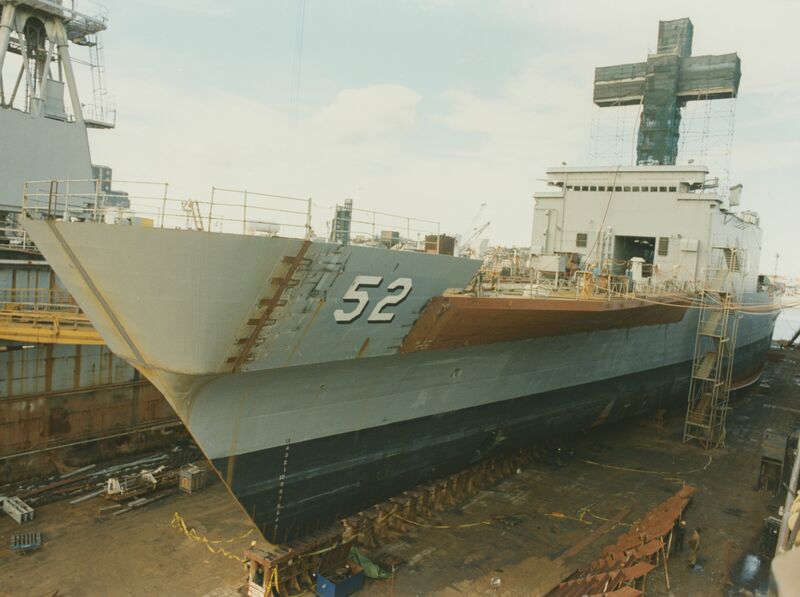 USS Fairfax County, September 1994 prior to commissioning into the Royal Australian Navy. HMAS Manoora in dry dock undergoing her extensive modernisation, Newcastle, NSW. 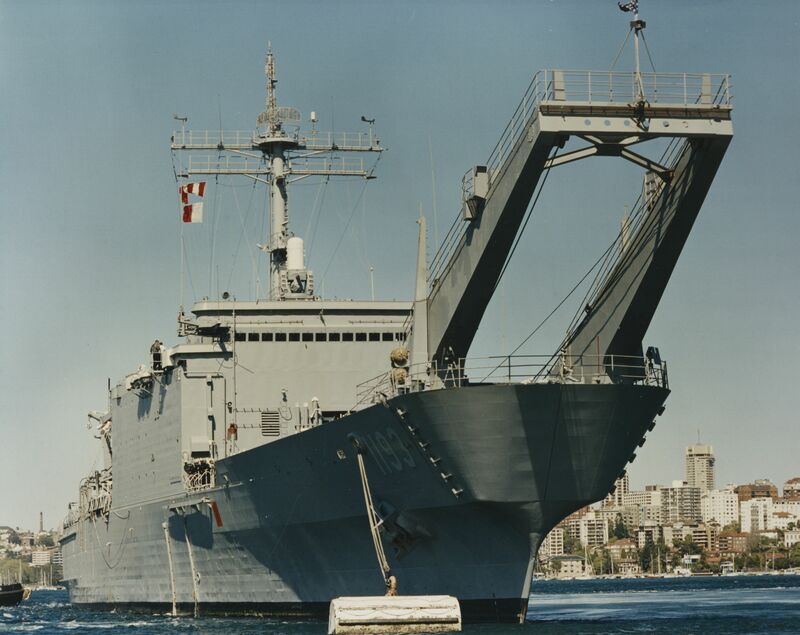 Between 1995 and 1999, Manoora underwent an extensive modernisation in Sydney and Newcastle to convert the vessel to a Landing Platform Amphibious (LPA). Work included extensive hull-preservation work, asbestos removal, installation of an electronic propulsion control system, the fitting of a 70-tonne crane, an engineering and sensor upgrade, installation of a modern medical facility, a new communications centre and modifications to the helicopter hangar. HMAS Manoora before and after her conversion. Note the addition of the 70 tonne crane, significant alterations to the bow and additional superstructure amidships. In January 2000, Manoora joined the fleet, beginning a commission in the RAN that would see her actively participate in national and coalition operations which spanned from the Western Pacific to the Middle East. After completing workups in February-March 2000 Manoora embarked soldiers from the 4th Battalion Royal Australian Regiment for amphibious trials in early April. Once these were completed she commenced first of class flying trials with Sea King and Blackhawk helicopters. On 17 April 2000 she commenced her first operational task when she anchored in Dili Harbour (East Timor) to offload civil aid material and two passenger vehicles. Manoora then embarked a large quantity of excess ammunition and general cargo via stern door marriage with the landing craft heavy HMAS Betano. The ammunition and stores had been dispatched to East Timor to support INTERFET in 1999 but not used. She sailed from Dili on the 18th and offloaded her cargo in Darwin on 20 April. Her next operational tasking occurred in June 2000 while she was conducting trials in Shoalwater Bay. A breakdown of law and order in the Solomon Islands capital of Honiara saw Manoora issued with the order to 'proceed with all dispatch' to Townsville to embark troops and Blackhawk helicopters. She then sailed for Honiara and rendezvoused with the landing ship heavy HMAS Tobruk and stood by, as part of Operation PLUMBOB, to evacuate Australian citizens if necessary. Manoora returned to Townsville in late June to offload the troops and helicopters and then began preparations for her involvement in Operation GOLD - as the guard ship to assist in providing security for the Sydney 2000 Olympic Games. Later that year, Manoora was assigned to Operation TREK supporting the International Peace Monitoring Team in the Solomon Islands. Between March and April 2001, Manoora again deployed in support of Operation TREK. She returned to Australia in June, before being assigned to border protection duties as part of Operation RELEX. During this period Manoora transported Unauthorised Boat Arrivals from the MV Tampa to a processing centre on the island of Nauru. 2001 also saw Manoora participate in Exercise TANDEM THRUST, and visit overseas ports in Malaysia, Vietnam and Thailand. An aerial shot of HMAS Manoora during Operation SLIPPER. Note the Australian flag painted onto her upper deck for easy identification from the air. In January 2002 Manoora deployed to the Persian Gulf as part of Operation SLIPPER, Australia’s contribution to the war in Afghanistan. She arrived in the Middle East Area of Operations on 28 February and assumed duties as the RAN Task Group Commander on 30 March. 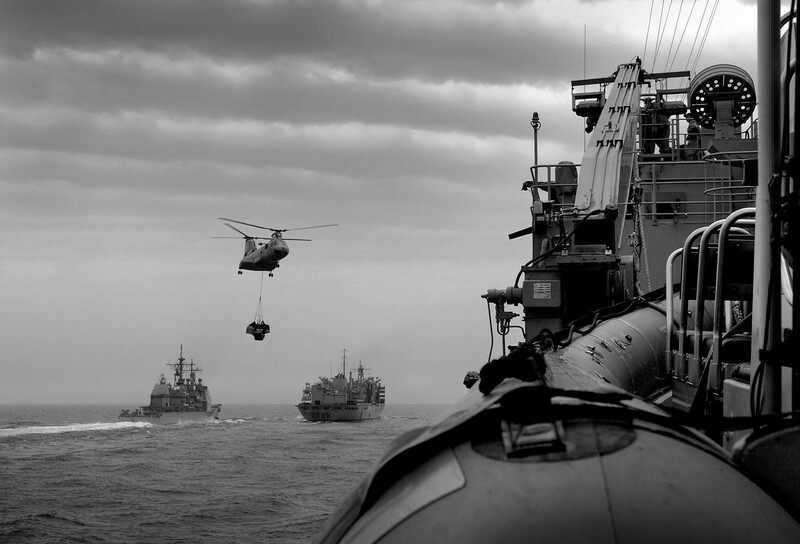 A Sea Knight transfers stores to HMAS Manoora during Operation SLIPPER. During the deployment, Manoora’s boarding parties conducted 27 compliant and 4 non-compliant boarding serials. Manoora was stationed, for much of her deployment, as the primary non-compliant boarding asset and the Khwar Abd Allah gatekeeper (the body of water lying between Iraq and Kuwait leading to Umm Qasr). Manoora departed the MEAO on 24 June 2002 and returned to Australia via Mauritius, arriving in Port Phillip Bay on 13 July. The remainder of the year was spent in Australian waters. Boarding operations were routinely conducted by Manoora during Operation SLIPPER. 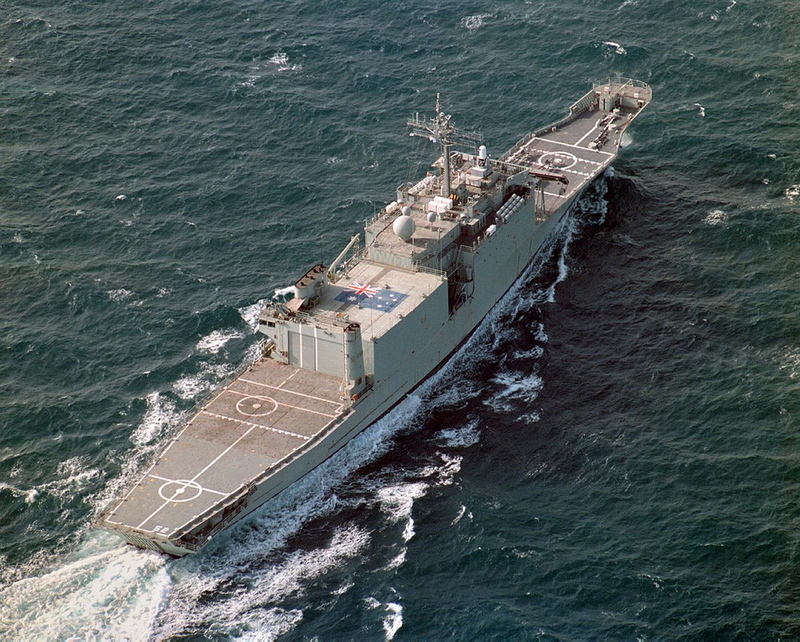 In May 2003, Manoora again sailed for the MEAO in support of Operation FALCONER, the Australian Defence Forces’ (ADF) contribution to the war in Iraq. She entered the MEAO on 3 June where she provided additional sea lift capacity in theatre and began back-loading ADF equipment and stores to Australia. She returned to Australia on 28 June. 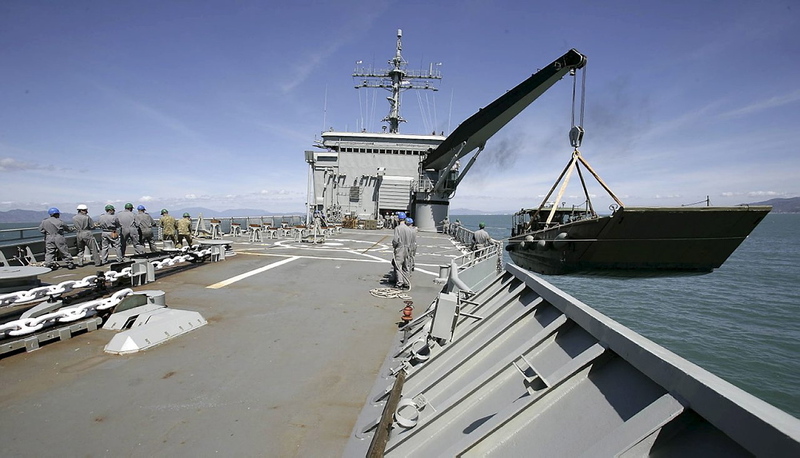 In July 2003, saw Manoora deploy from Townsville to the Solomon Islands in support of Operation ANODE, the ADFs’ contribution to the Regional Assistance Mission to the Solomon Islands. Manoora entered the AO on 24 July where she provided logistic and air support for the Maritime Task Group throughout the deployment and transported the rebel leader, Harold Keke, to Honiara following his arrest. Manoora departed the AO on 29 October 2003. During 2003 Manoora also participated in Exercises SEA EAGLE and VITAL MARINER. During the first half of 2004, Manoora participated in Exercises OCEAN PROTECTOR and TASMANEX in New Zealand before undergoing and extended refit covering the period April 2004-May 2005. Between July and September 2005, Manoora deployed in support of Operation RELEX II, before returning to Sydney in November for further maintenance. Throughout 2005 she also participated in Exercises TALISMAN SABRE, DAY TOOTHFISH and MERCURY. HMAS Manoora lies at anchor off the coast of Dilli, East Timor, as plumes of smoke rise into the air from the direction of the city during Operation ASTUTE. In March 2006 Manoora contributed to Operation ACOLYTE in support of the Commonwealth Games in Melbourne. Further operational service followed in May, when Manoora sailed for East Timor with 320 army personnel, a Sea King and 4 Blackhawk helicopters embarked in support of Operation ASTUTE. After successfully landing her embarked force she provided logistic support, before returning to Australia and sailing for Hawaii to participate in Exercise RIMPAC during June-July. By the years end she had also completed Exercises OCEAN PROTECTOR and CROIX DU SUD in New Caledonia. An LCM8 conducts a stern door marriage with HMAS Manoora during Exercise SEA EAGLE in November 2007. The high operational tempo continued into 2007. During April-May, Manoora contributed to Operation RESOLUTE conducting patrols in the waters west of Melville Island out to Ashmore Reef. This was followed by a maintenance period between August and October before taking part in Exercises SEA LION, TALISMAN SABRE, SEA EAGLE and PACIFIC REACH. Successful port visits were also conducted in Indonesia and Singapore. HMAS Manoora cranes an Army LCM8 onto the forward flight deck in August 2008. Between February and March 2008, Manoora deployed in support of Operation RESOLUTE and conducted extensive border protection patrols in the waters north of Australia and in the Indian Ocean from Cape York to Christmas Island. Later, in November, Manoora was tasked at short notice to participate in commemorative services for HMAS Sydney (II) over the site of her wreck with 284 descendants of Sydney sailors embarked. 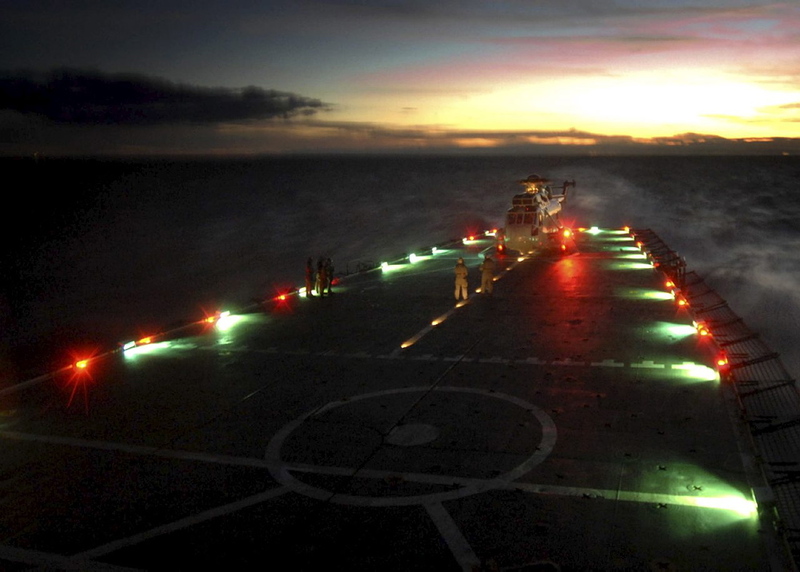 A Sea King helicopter during Night Deck Landing Practice onboard HMAS Manoora. During 2008 Manoora also participated in Exercises JOINT KIWI, in New Zealand and SEA LION. The following March, Manoora participated in the Sydney Harbour Fleet Entry, Fleet Divisions and Fleet Review as well as the RAN Fleet Freedom of Entry march though Sydney on 14 March. Flight deck personnel on board HMAS Manoora inspect the deck to ensure there are no loose foreign objects prior to commencing MRH 90 First of Class Flight Trials. MRH 90 'Cobra 08' prepares to take off during the First of Class Flight Trials on board HMAS Manoora. In May she transported personnel and equipment to Weipa for the Army Aboriginal Community Assistance Program and between June and July 2009 she again contributed to Operation RESOLUTE, conducting patrols in waters west of Melville Island out to Ashmore Reef. A maintenance period followed between August and October before Manoora assumed the role of Operation RESOLUTE Long Haul Response Vessel over the Christmas/New Year period. By the end of 2009 Manoora had participated in Exercises MARS HARPOON, COMMANDO RAJA, NEW HORIZON, TALISMAN SABRE, and visited overseas ports in Malaysia, Singapore and Indonesia. 2010 saw Manoora operating in the Eastern Australia Exercise Area before participating in Exercise SEA LION and conducting port visits to Townsville, Cairns, Hobart and Burnie where she exercised Freedom of Entry into the city. In April she took part in Exercise CROIX DU SUD in New Caledonia before returning to Sydney. Between May and August, Manoora remained alongside in Sydney undergoing maintenance before sailing in September for work ups and participation in Exercise HAMEL in Queensland waters. There she visited Brisbane before taking part in commemorative services associated with the discovery of the wreck of the Australian Hospital Ship Centaur. The results of the LPA Seaworthiness Board then necessitated her return to Sydney and the commencement of a Chief of Navy directed Operational Pause. 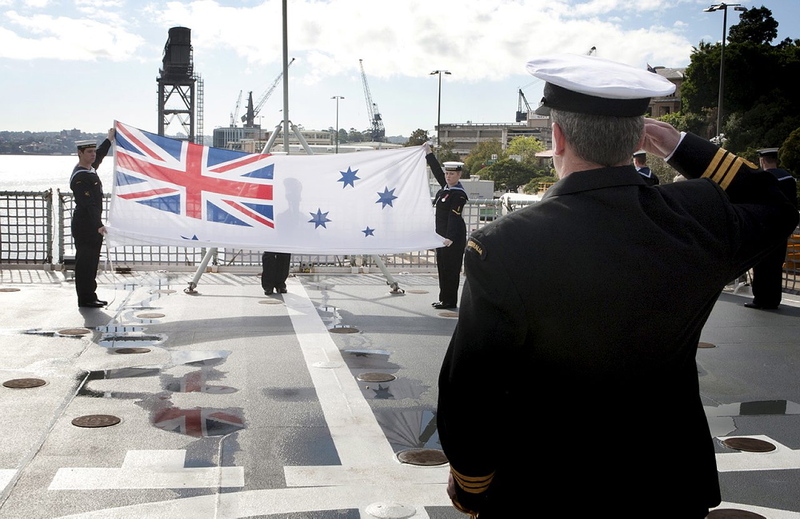 Commander Stephen Dryden, RAN Commanding Officer HMAS Manoora salutes the ships Australian White Ensign as it is formerly decommissioned on the flight deck at Fleet Base East. HMAS Manoora ship's company March Off during the ships Decommissioning Ceremony at Fleet Base East, led by Commander Stephen Dryden, RAN. In February 2011, the Minister for Defence announced the early decommissioning of Manoora. 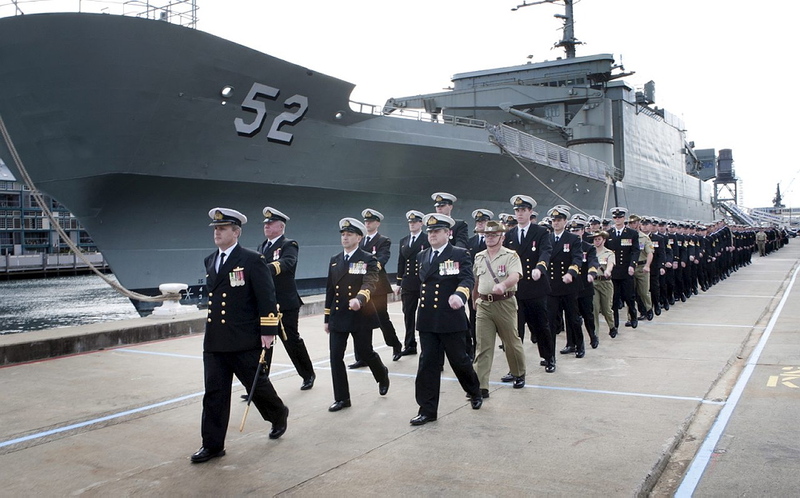 HMAS Manoora was decommissioned on Friday, 27 May 2011 in a ceremony held at Fleet Base East, Garden Island, Sydney. On 24 June 2013 the then Minister for Defence Materiel, Dr Mike Kelly AM MP, announced the sale of Manoora and her sister ship Kanimbla to Southern Recycling LLC located in New Orleans, Louisiana, USA. Notwithstanding their recent service in the RAN, the disposal of the two former US Navy ships required US Government consent in accordance with US International Traffic in Arms Regulations. Contract negotiations were completed in early May 2013 and the disposal contract was signed on 20 May 2013. Both ships were subsequently towed in tandem, by the ocean-going tug Salvage Ace across the Pacific Ocean and through the Panama Canal where the tow was taken over by the Smith Maritime tug Elsbeth II on 12 September 2013. From Panama they were towed to Gulfport Mississippi arriving there on 3 October 2013. 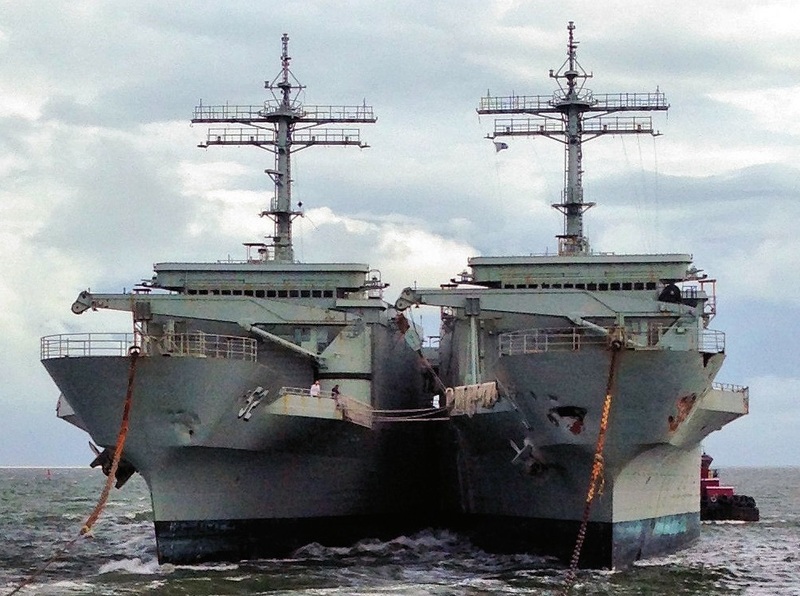 From Gulfport, the two former warships were towed independently to their final destination, Southern Recycling, where they were cut up for scrap. Manoora and Kanimbla arriving at Gulfport, 3 October 2013.